It is possible to attract the attention of users towards the most important visual elements of an interface. There are different techniques to do so. In a previous post, we have seen that one of the main elements to obtain this result is the use of an efficient “Netway Neuro-Visual Landscape”™. the visual hierarchy within the screen. Before explaining how to use these techniques, it is important to understand their relevance. 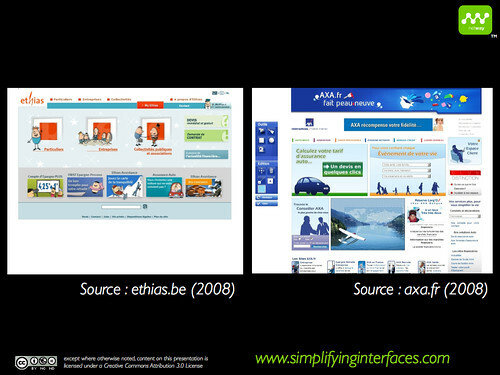 Let’s have a look at two insurances sites: the Ethias site (ethias.be) and the new AXA site (axa.fr). I have taken similar sites: the tasks surfers will perform on these two sites, are largely similar. Let’s start by comparing the number of graphical elements in the two screens. The Ethias screen is composed of 14 graphical zones, whereas AXA counts 26. When we analyze the first ocular fixation, we get the information our eyes will send to the brain. The more zones are used in the “Netway Neuro-Visual Landscape”™, the more difficult it will be for our brain to distinguish the zones and to isolate them in the peripheral vision. On the Ethias site, we see that 12 out of 14 zones are easily distinguishable one from the other. This is not the case for the two green buttons at the top right of the interface. A conscious choice: the size of the action button zone gets more weight in our peripheral vision and is more important in the “Netway Neuro-Visual Landscape”™. 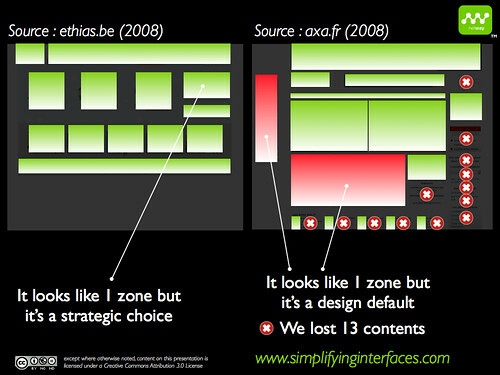 On the AXA site, we see that there is not enough space between a number of zones. As a result, these zones are not easily distinguishable one from the other. This could have been avoided if the knowledge of the human visual system would have been put into practice. Moreover, 13 types of content are not visible at the first fixation. If these zones are not visible, then why would our brain direct our eyes to visit these zones? Let’s now compare the geometrical structure and the visual organisation of the screens. The Ethias site has a geometrical structure. The different zones of the screen have also been organized. Welcome to the concrete application of the Gestalt principles. Similitude, proximity, good continuity, symmetry… All these principles have been used when I was creating this screen (I will get back to these principles in coming articles). The AXA site has little geometrical structure and a weak visual organisation. 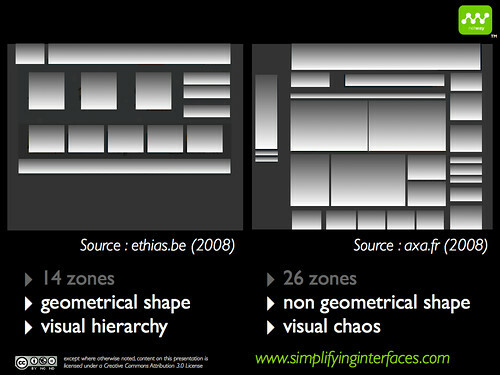 So, why would it be so important to have a good geometrical structure and visual organisation? The answer can be found in our brain: it contains a zone that memorizes the topographical data of the screen in front of it, and gives these data a meaning. More geometrical structure means our brain needs to store less topographical information. 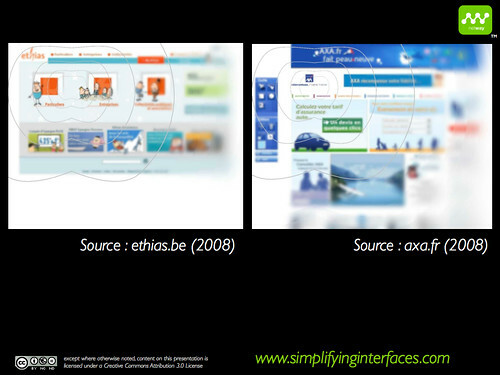 The result: a strong “Netway Neuro-Visual Landscape”™. A strong “Netway Neuro-Visual Landscape”™ allows our brain to build a visual hierarchy between the different elements of a screen and to determine strong topographical anchor points. This will help the user to quickly find what he is looking for and to easily use the screen in front of him. I hope you now see why this technique is so important. I will get back to it in the next post and talk about focal points and visual pathways.